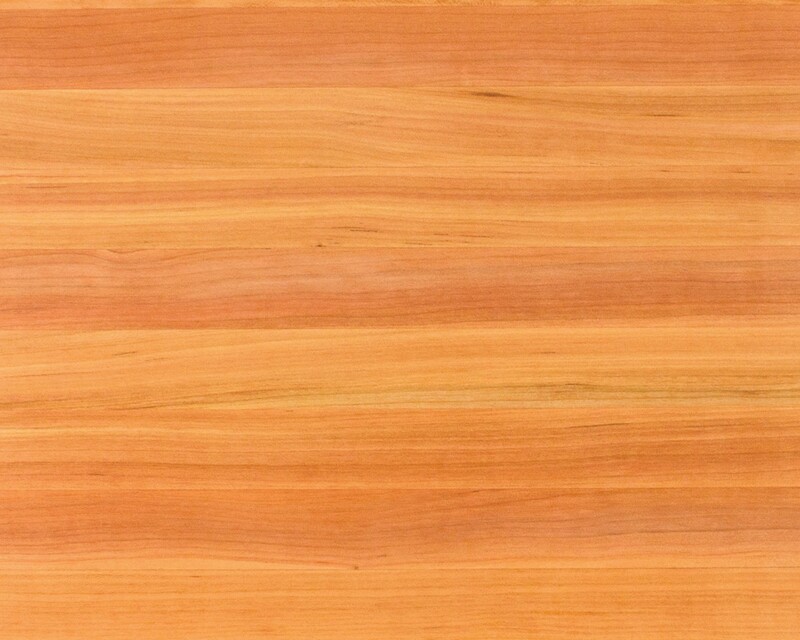 Note: Natural cherry wood is lighter in appearance than cherry-stained wood. Also, its color can vary with the ratio of red heartwood (core of the tree) to light pink sapwood (between the core and the bark) in the board. 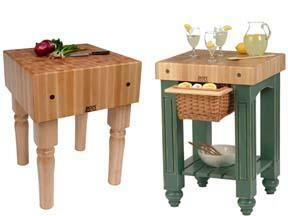 Cherry wood will appear light in color when new, but will darken over time. The thumbnail photos above provide an example of how cherry countertops will patina with time (in sequence, from left to right). 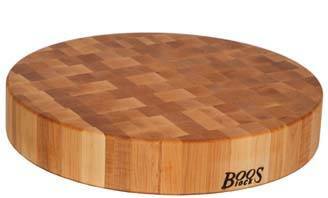 Note: Cutting into a countertop (e.g., trimming its length or width or executing miter cuts or cutouts) will void the manufacturer's warranty. We will be happy to provide a price quote for a factory-warranted cut or cutout if you contact us. 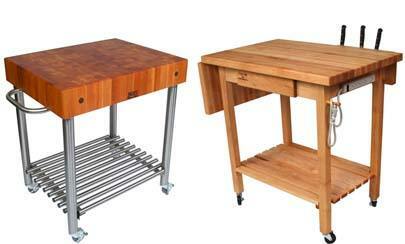 Note: In countertops 96” and longer, some wood rails might not span the full length of the countertop. In such cases, some wood pieces might be finger-jointed together and metal fasteners might be used to add structural strength. 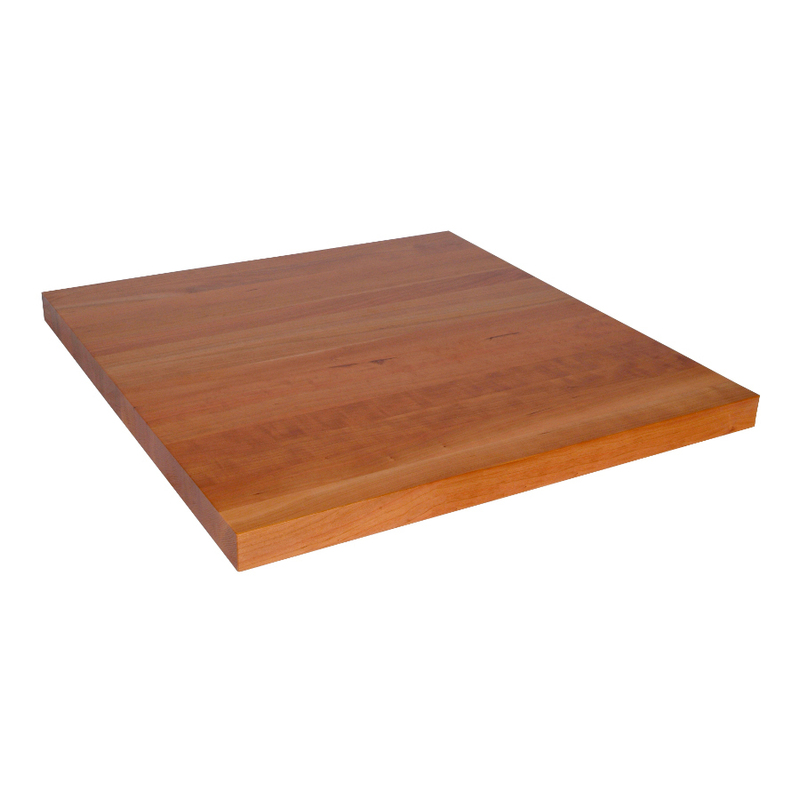 If you’re contemplating a countertop makeover to add elegance and function to your kitchen, consider an upgrade to strikingly beautiful American Cherry butcher block. 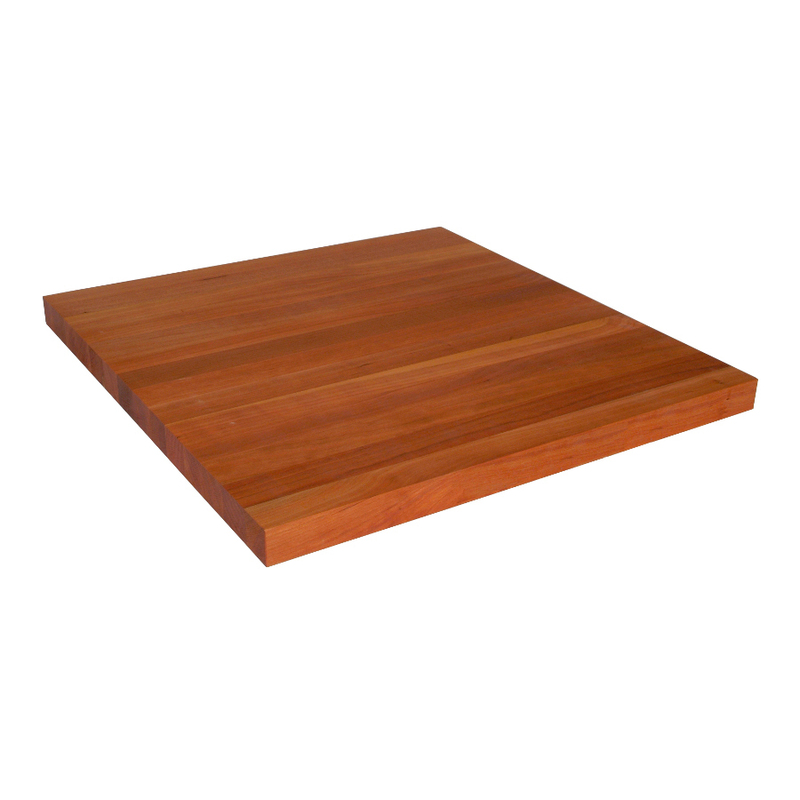 Its light and dark red hues can add warmth and richness; plus there’s no better surface for food preparation tasks. Gorgeous Wood Countertops Constructed In Edge Grain Style by John Boos & Co.
Edge-grain butcher boards have no unsightly seams where wood rails would otherwise abut end to end. All seams run parallel to one another and run the full length of the board. In making such counters, wood rails are laid side by side and bonded together using high-strength adhesive, compressive force and intense heat. John Boos & Co. makes the countertops sold by Butcher Block Co. Boos, a leader in the food service industry, has had over a century to master the process and stands by its work, as do we. Before shipping any countertop from its Illinois wood plant, the skilled craftsmen at Boos apply a coating of Boos Mystery Oil that seals the wood’s pores. 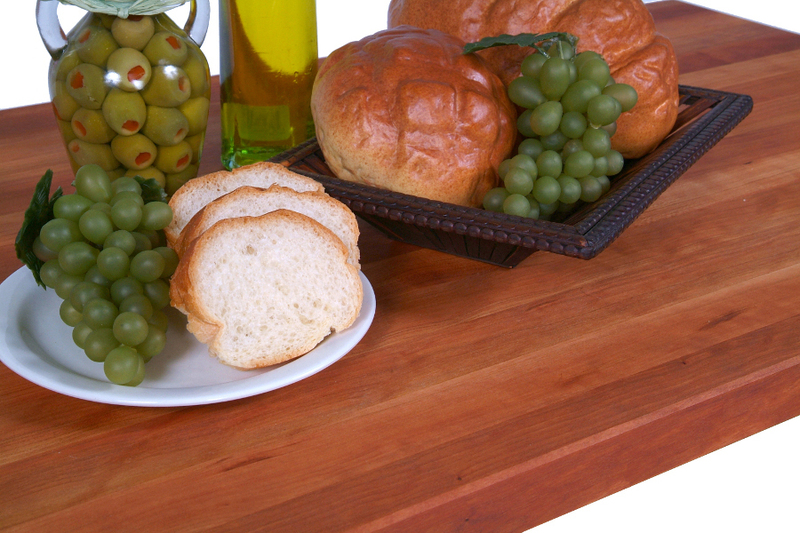 This natural, food-safe oil blend is the standard finish for countertops and recommended for boards that will be cut upon, but a semi-gloss varnish called Varnique is also available. Varnique provides a beautiful luster and the look of fine furniture, but is not intended to be cut upon. Whereas the Varnique finish requires little maintenance, the natural oil finish requires re-application in order to protect the wood from drying and cracking. We strongly recommend that you add Boos Mystery Oil or Board Cream with Beeswax to your order. 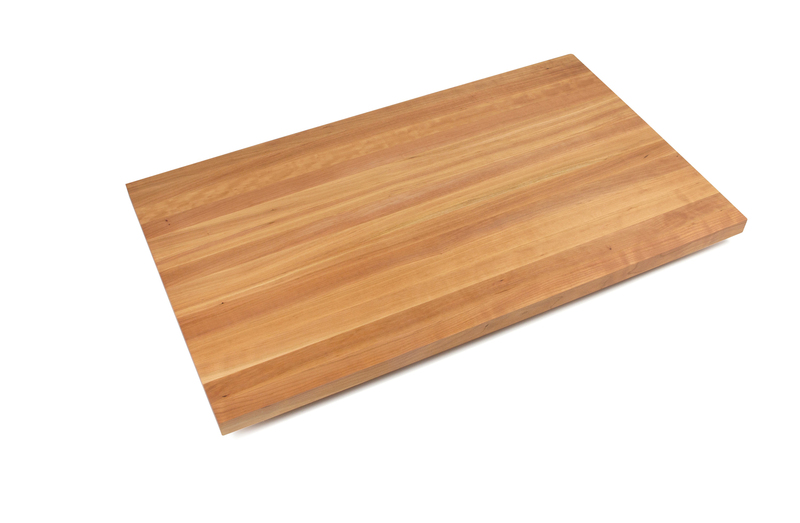 We offer edge-grain Cherry counter tops in thicknesses of 1.5”, 1.75”, 2.25” and 3”, and in standard sizes up to 145” long and 48” wide. If a standard size won’t do, or if you’d prefer an edging other than our standard (slightly eased, top only), we can offer you a custom solution. 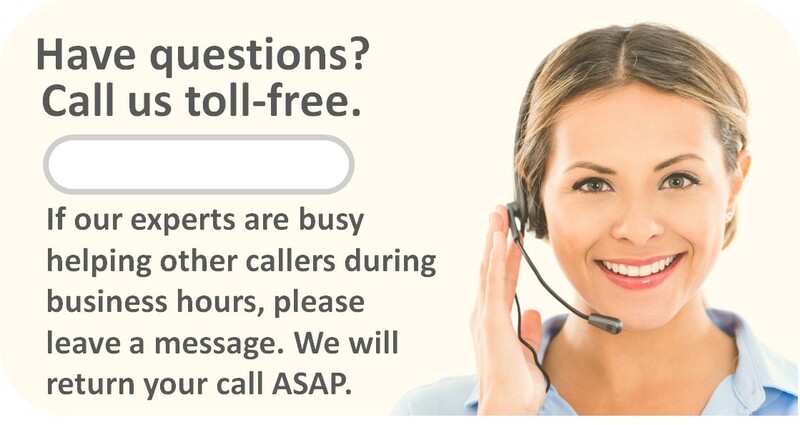 In fact, we can provide you with an instant online price quote in four easy steps. A classy backsplash can showcase your counters in the same way that a picture frame accents fine artwork. Plus it’s practical too: less mess means a quicker clean-up. These backsplashes, also made of American Cherry, are 3/4 “ thick and 4” high.